Posted: March 1, 2013 by blackdaffodil in Cutswatch, Demonstrate, Rally & Occupy! Bring banners, placards, street theatre and more! Andy Slaughter MP and Steve Pound MP will join the protest. On 5th March a Lord’s committee will discuss secondary legislation that will mean virtually all NHS commissioning will have to be done through competitive markets. On 13th February 2013 the Government published the regulations (SI 257) under Section 75 of the Health and Social Care Act 2012. This Statutory Instrument (SI) will be going to the Lords Secondary Legislation Scrutiny Committee on 5th March; this Committee will then report to the House and the regulations would become law on 01 April. 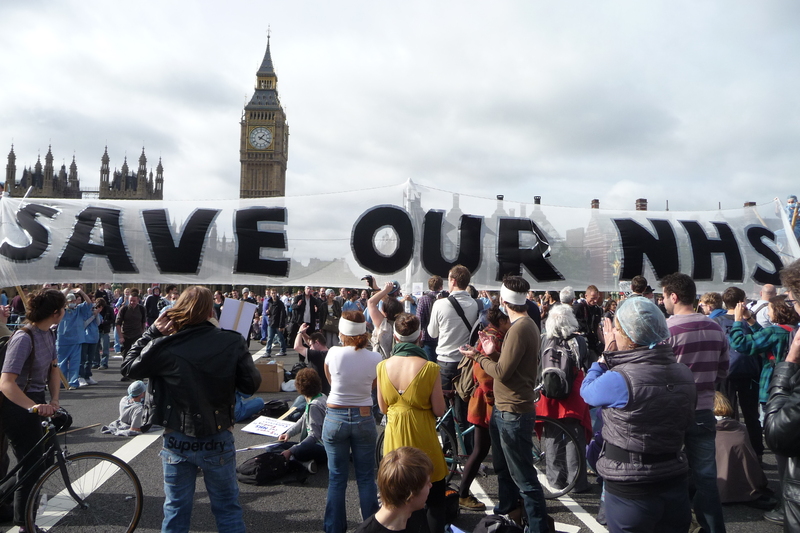 Assurances were given by ministers during the passage of the Bill through Parliament that it did not mean the privatisation of the NHS, that local people would have the final say in who provided their NHS. The regulations just published break these promises by creating requirements for virtually all commissioning done by the National Commissioning Board (NCB) and Clinical Commissioning Groups (CCGs) to be carried out through competitive markets, which will have the effect of forcing through privatisation regardless of the will of local people. They contain legal powers for Monitor to enforce the privatisation spontaneously or at the request of private companies that lost bids. There is an urgent need to raise the public profile about what this threat represents and organise action against it. Please could you help by publicising the protest and circulating this email. If you could help with press or publicity, placards or in other ways please let us know. Ask your MP to raise the issue and join us at the protest. See below for information about petitions and other action you can take. Posted: November 19, 2012 by blackdaffodil in Cutswatch, Demonstrate, Rally & Occupy! Come to the demonstration at 2 p.m. on 24th November! 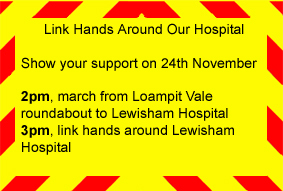 (Please visit the Lewisham Keep Our NHS Public site for the most up to date information, the below is quoted from their webpage). 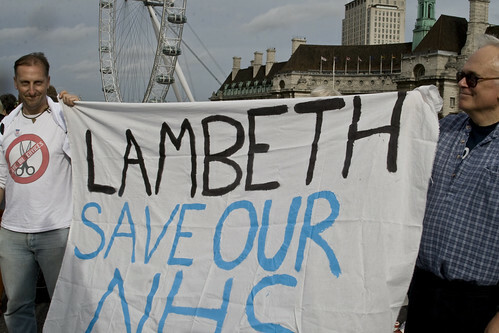 ASSEMBLE from the corner of Lewisham High Street / Rennell Street (diagonally opposite Lewisham Police Station – Loampit Vale round-a-bout) for a demonstration to Lewisham Hospital to save Lewisham Hospital. Stop the Tory-appointed technocrat at South London Healthcare closing our A&E to pay Private Finance Initiative (PFI) debts to banks and make profits for a private takeover at neighbouring hospitals. Angry? For starters, sign the petition from here then see our ‘What You Can Do’ page AND check out the Save Lewisham Hospitalspecific site. Over 500 people met at the Lessof Auditorium, the Lessof overspill area and at the Calabash Centre on 8th November to defend our NHS, read the story from here – now comes the real action! Posted: October 10, 2011 by blackdaffodil in Demonstrate, Rally & Occupy! About 3000 people attended. Many people have memories of being kettled on this very bridge last winter on one of the tuition fees protests. And recently people were kettled, beaten and arrested on Brooklyn Bridge in New York City as part of the Occupy Wall Street protests. So perhaps worries over the strategic challenge of occupying a bridge kept some people away. I brought along lots of layers in my rucksack in case we got kettled, but happily it turned out to be unnecessary. An early morning rain had also subsided into a warm but not hot afternoon, with scattered sun. The weather was fine for a day out. There were loads of great colourful banners and homemade placards. This was encouraged by a guy who gave out speech bubble placards and marker pens for people to write out their own personal slogans. “Block the Bill” stretched across the southern end and “Save the NHS” suspended between two tripods, occupied by protestors in surgical uniforms. There was a refreshing lack of mass-produced party political placards on the southern end of the bridge! Adding to a carnival atmosphere similar to Reclaim the Streets actions of the 1990s, people dressed up in hospital scrubs and surgeon’s masks or blood-spattered patients; sound systems serenaded different parts of the bridge and a samba band drummed. There was also an assembly for planning ‘Occupy London’ actions. Reports on this were positive, though I missed most of this when I went to get some lunch. The assembly continued with personal contributions with health workers and health services users, plus some more comedy. Around 4:30pm the banners went down. The crowd moved from the bridge, with one group going down to the Southbank and another with the samba band headed towards the roundabout at the end of Westminster Bridge. Rumour had it they were headed to Parliament Square by way of Lambeth Bridge. I was already near the roundabout so I joined the second group. But this all seemed to break up and I went home.